Because blogger is about to stop supporting FTP I decided to move my blog. 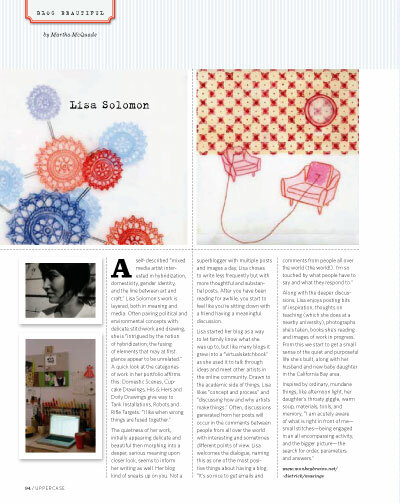 It's now located at: http://lisasolomon-musings.blogspot.com/. I will be leaving this blog up where it is for posterity's sake, but be sure to follow me over to my new home. You will be automatically redirected in 30 seconds, or you can click here. 0 Comments Published by lisa s on 23 March 2010 at 1:54 PM. i apologize for my lack of a post last week....we are having some pretty glorious weather round here. makes up for the 7th round of sickness that we've been dealing with. to say that this winter has been brutal in the sick department would be an understatement. it might be safe to say that i have intimately known almost every virus that has floated around this winter. i'm happy it's spring because i'm hopeful that it means the end to the cold season. i'm not holding my breath because if a spring cold comes around chances are we'll get it, but it's nice to be hopeful. with all this great weather the little is frantically using her favorite word - out. she says it double time. out out. and with a canadian accent. [not sure why but it's true]. basically from the minute she wakes up until the end of her day she'll go to any exit or window and emphatically request out out - out out. it's really cute - except for when you have to tell her - i'm sorry we just came in from out out - or no - we have to stay in in now. what a pathetic and sad face she sometimes makes. occasionally she'll even whimper "out out" "out out". if she could figure out a way to stay outside all the time i think she would. last week i had the immense pleasure and treat to spend the afternoon with martha of uniform natural . she came out to my studio and we sat and chatted. my parents were here and so our visit was peppered with interruptions from the little, but mostly we were able to discuss art and process and making in a really lovely way. martha is incredibly astute and sincere in her observations and questions and responses [as if you had any doubt about that]. i could feel my body and mind viscerally responding - reverting to familiar territory - thinking more academically and speaking about one's intentions and ways of making in a meaningful and purposeful way. highlights from our talk: the differences between architecture and art [some of them anyway - revolving around the idea that architects must be more concerned aware of public safety and more concerned about "client satisfaction"] ann hamilton , tara donovan , my desire to visit the walker , and how architects have an incredible ability to accurately access situations/people, and how they are so aesthetically put together [best clothes and glasses. always]. i am so grateful to the internet for providing the means for this to happen. and so - i have to get cracking. i have a statement to concoct, a website to update, artwork to tackle, dishes to wash, a studio visit to prepare for.... i'm still hoping to write a spring manifesto . happy tuesday! 0 Comments Published by lisa s on 22 March 2010 at 2:46 PM. the random.org number generator picked 44. which turns out to be this is yellow . please contact me and i'll get your doily shipped out to you! i just want to say how LOVELY it was to read the enthusiasm about this project. and how great it was to see and "meet" some new to this blog peeps. and i wish i had enough doilies to give to everyone because i loved the thoughts on where everyone would put them. i think i'm going to work on making a limited edition set of small vinyl doilies so hopefully anyone who wants them can have them. doilies all over the world in all sorts of places is a daydream i'd love to make a reality. it's a matter of production - where, how much, etc. but i am starting to research. if anyone has any ideas/thoughts/leads on this, i'd love to hear them. i've been working on a new idea in the studio. here's a first sketch of said idea. well actually it's the backside of said sketch. i always love the backside of embroidery. so much that sometimes i show it as the front. in this case that probably wouldn't make sense, but out of habit i always turn something over when i'm done working on it to see what it looks like. almost every time i like it just as much or MORE than the front. the problem with this idea of mine is that one piece will most likely not stand alone. and i'm not sure what kind of fabric to use. 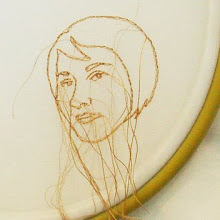 this idea stems from my desire to actually do something SUPREMELY minimal with thread - simple. clean - but with a hidden meaning/agenda if you choose to look for it. i just don't know if it's going to translate yet. 8 Comments Published by lisa s on 11 March 2010 at 8:46 AM. so.... i didn't really want to talk about this beforehand because i had NO IDEA how it was going to turn out. i got to have a sol lewitt experience. when i was asked to be in depth of surface at san francisco state the gallery director asked me to have a visionary moment outside of the building. he said : we have a vinyl cutting machine. you make doilies. we'd love to make vinyl doilies and stick them all over the entrance doors. we have tons of students who can work on this. game? heart racing as i had wanted to do this for years - in fact i researched getting vinyl doilies but couldn't afford to get them cut... i quickly said yes. so several emails and an map i generated in illustrator later.... voila. they did it. and not only did they do it - they did it ALL over the building. and the give-a-way? well - they gave me some extra doilies. so comment here with where you'd want to put one if you had one and i'll pick a winner next thursday :: 3/11. 56 Comments Published by lisa s on 03 March 2010 at 8:45 PM. so... last year this 7' drawing was on exhibition at a gallery. this year i've taken this drawing and added some more wall elements to create an installation for a show opening this Saturday - the 27th - at the fine arts gallery at San Francisco State University. this is the drawing that was all about me being pregnant - here's the skinny on it. and i also have to thank gwen as she sent a fantastic box [she always sends lovely packages]. in it was a valentine robot for the little. who immediately said ooh ooh and hugged it.... how cute is that?? gwen was kind enough to post a tutorial on how she made it so you can make one too. nothing like robot love . i'm happy that even though it's not mine, i get to hug it too ! and one more thing to note: on saturday i start a month long stint over at habit . if you have yet to see habit then you really should take a gander. the brain child of emily and molly it's a lovely place to stop and behold. i have to dust off my camera and try to take some good pictures. nothing like a bit of pressure, no? 11 Comments Published by lisa s on 24 February 2010 at 1:55 PM. i really love all her work, but these hand embroidered organza "plastic bags" are just SO delightful. none of the images on her site do her work justice. i particularly love the concrete and thread/organza pieces - like this one . it's always a treat to meet artists that you have admired and have them be as wonderful as their work. it doesn't ALWAYS work that way - so when it does - well - it's icing on the cake. i'm always disheartened when people continue to want to push a hierarchical divide between art + craft. one artist in particular was speaking about it's all about intention. in essence i can agree to that since ever since duchamp pointed his magic art wand and declared things art - you can "intend" almost anything into art. but i also feel that art can be born even where it WASN'T intended - in some ways it's art even if someone else intends it. this artist also spoke about how they felt that you discover "truth" and "something about yourself" while making something as an artist that you don't while making "craft" [i'm really generalizing here but you get the idea]. honestly - i think that's a load of bull. i think there is "art" that is fantastic/horrid and "craft" that is fantastic/horrid and that you can have an "art moment" [aka epiphany] in front of anything that you please - be it art/craft/utilitarian item. trying to separate them into these meaningful and ultimately elitist categories seems so 20th century [i'm being facetious here - kind of]. i always want my art to be well crafted and my craft to be artful. to me it's not about if macaroni art is "art" or gees bend quilts are "craft" - it's about what moves you in some way in any given moment [and that movement doesn't need to be like or love either]. enough said. and the cuffs of unlooking pants. holding the room to itself. i loved cat's cradle when i was a child - although i didn't have a sister to play with... how much do i love that last thought... holding the room to itself? so much. thank you thank you lindsay. 10 Comments Published by lisa s on 17 February 2010 at 2:49 PM. this piece is in an exhibition called by a thread which opened friday at the san jose institute for contemporary art . there is an artist talk on thursday night and i will be there. first standing by my piece to answer any questions about it [they mandate this!] and then as part of a panel talking about the exhibition. if anyone is in the south bay and wants to see me wiggle and squirm in front of my piece - i'll be there! this is an older piece of mine. they are all self-portraits - the images of me i collected when i went to visit my parents. they were all wallet sized photos - and thus the title of the piece is "wallet sized me". i'm showing the wrong side [back] of the embroidery. the side you don't see is actually neatly stitched. there are a couple reasons for this - one of which is just to reveal what is normally hidden. this was my passport photo when i was 2.
and some press :: i'm the blog beautiful feature in uppercase magazine issue 4 - thanks martha . uppercase is really really really a beautiful publication. they do a bang up job. and just because :: the plum trees are blossoming all over the place. i brought a few branches in to make it feel like spring. 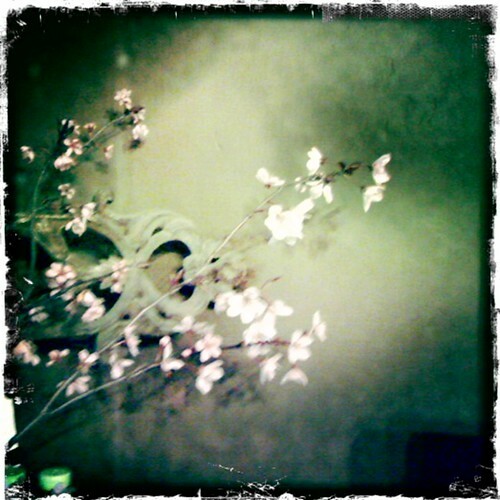 i took this photo using my iphone and the hipstamatic app . man is that a fun app to play with. hope everyone is having a good week. today there were blue skies and big fluffy clouds. fluffy clouds always make me happy. 15 Comments Published by lisa s on 09 February 2010 at 8:12 PM. hello and welcome to my blog. i'm a mixed media artist living in oakland, CA with my husband, 2 dogs, 1 cat and my baby daughter. i try to post once a week about things that inspire me, what's going on in my studio, and little tidbits of my life. thanks for visiting, reading and commenting! please please please :: i am happy to have you use an image of mine on your blog or somewhere else, but PLEASE just ask permission before you do. and please don't hot link. it really is important that we respect one another and the work we do. and if you are too shy or busy to ask, could you at least link back to me? thank you in advance! © 2004-10 Lisa's Musings | Blogger Templates by GeckoandFly.